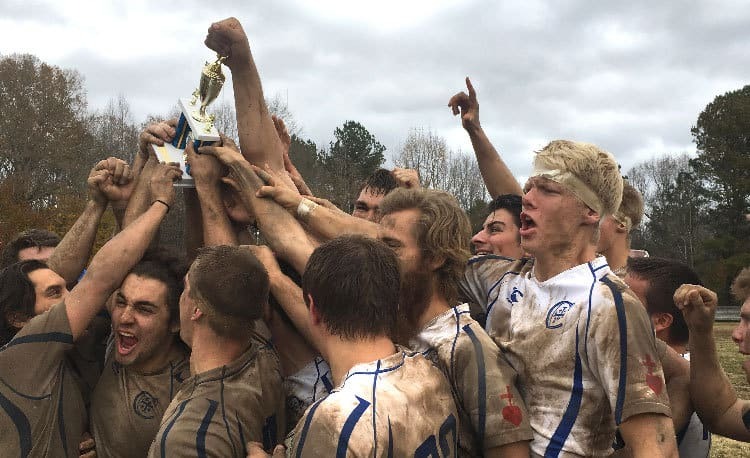 The Christendom College Crusaders are now the Mid-Atlantic South Region Champions in rugby. The Christendom Crusaders defeated the Catholic University of America in a thrilling final match on Sunday afternoon 43-24, wrapping up a mud-soaked weekend and earning their first trip to the NSCRO 15s Final Four in April. Christendom entered the weekend as the #3 ranked team in the nation, ready to win after falling early in the 15s National Championship playoffs last year. The Crusaders played Loyola University of Maryland to start the weekend in Raleigh, North Carolina, and the two teams played staunch defense for the first 30 minutes of the game, keeping the match at a 0-0 tie. Finally, Christendom put 3 on the board with a kick from Thomas Audino, before pouring on two more tries before the half. Loyola would only score one try the rest of the way, with Christendom eventually winning 23-7. 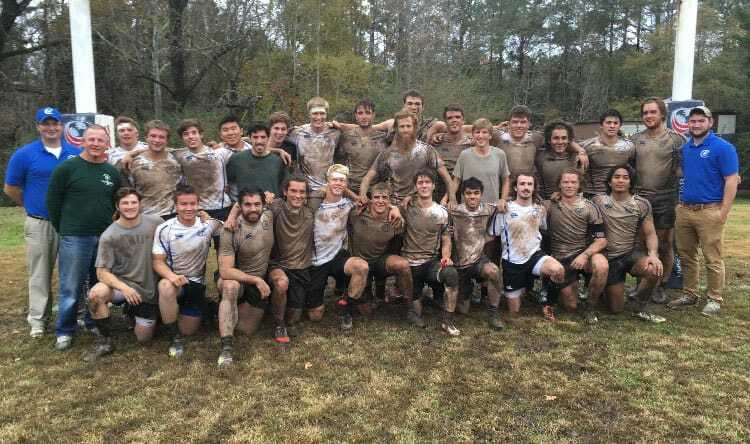 Sunday afternoon brought muddy conditions to Raleigh for the final match between #3 Christendom and #4 CUA, and both teams quickly went on the attack, showing aggressive defense. Christendom broke through the defense first within the opening ten minutes, before CUA tied the game at 7 a piece near the end of the first half. The Crusaders immediately responded with a try of their own from freshman Richard Rojas — his second of the game, finishing the first half 14-7 Christendom. CUA pulled off an extraordinary opening drive to start the second half, scoring another try but failing to make the conversion kick. That drive clearly lit a fire under the Crusaders, as they immediately marched down the field to score another, raising the score to 19-12. Rojas would score his third try of the day soon after, with Thomas Audino scoring one of his own as well. From there, Christendom’s disciplined defense took over, stopping CUA time and again from gaining any ground on the field. Joe Kelly and Nicodemus Kaufman would score tries of their own, finishing the game in momentous fashion for Christendom. The final score was 43 Christendom, 24 Catholic University, with junior Thomas Audino being named the MVP of the championship. The win earns Christendom its first trip to the NSCRO 15s National Championship in April, where they will compete in the Final Four for a shot at the title. Help Christendom make its way to the National Championship by donating today at https://www.christendom.edu/gift/donation-page-athletics/. Please write “Rugby Nationals Donation” in the comment box. For more information, please visit christendomathletics.com.